Mitt Romney's campaign got a major boost on Tuesday with the endorsement of Chris Christie, the New Jersey governor many conservatives had pinned their 2012 Republican presidential hopes on. 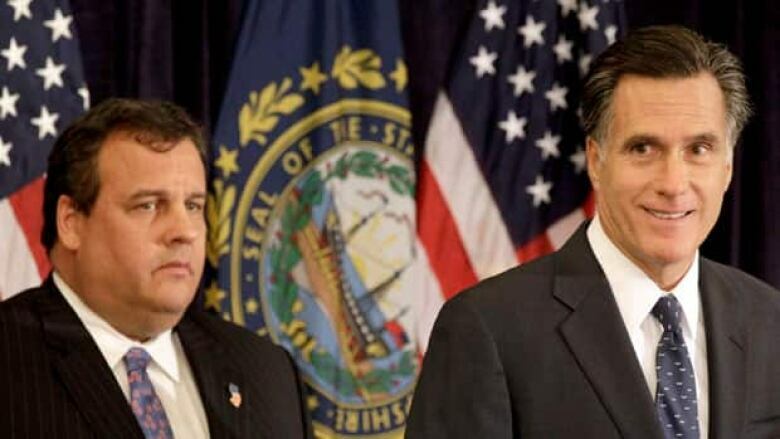 Mitt Romney's campaign got a major boost on Tuesday with the endorsement of Chris Christie, the New Jersey governor many conservatives had hoped would be the Republican candidate in the 2012 U.S. presidential election. The announcement, which comes only days after Christie disappointed his backers by announcing he was not ready to make a run for the presidency, comes at an opportune moment for Romney, who will face hard-hitting attacks from the rest of the Republican field at a debate in Concorde, N.H., Tuesday night. Romney will be on friendly ground in New Hampshire, where he finished second in the 2008 primary. And his campaign can now expect a huge infusion of cash from Christie's financial supporters, who had been waiting for him to decide before backing a different candidate to defeat President Barack Obama. Romney, is the current front-runner, despite drawing fire from evangelical critics — one said recently his membership in the Church of Jesus Christ of Latter Day Saints (Mormons) shows he is a member of a "cult" and not a true Christian — to Tea Party activists who believe his decision as Massachusetts governor to back a health-care law that included a mandate to purchase insurance — which is also part of Obama's health-care reform — shows he is not a true conservative. Romney also stands to benefit from the budget-cutting Christie's ties to the Tea Party, a group of conservative voters that Romney has struggled to win over. Texas Gov. 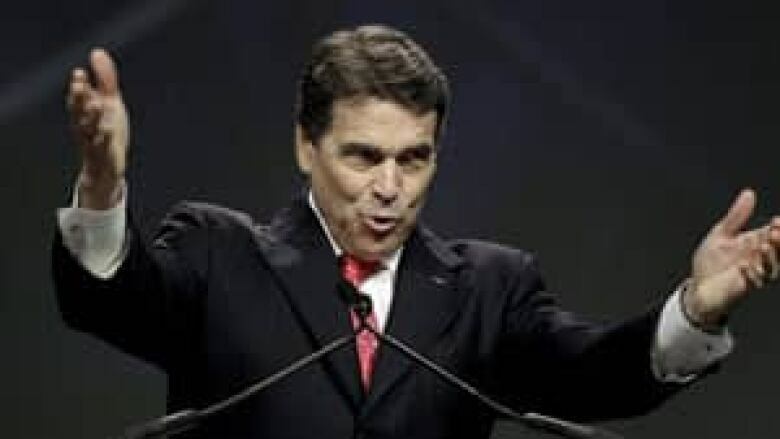 Rick Perry is hoping to rebound in New Hampshire on Tuesday night following poor showings at previous Republican presidential debates. ((David J. Phillip/Associated Press))A strong showing in the debate is crucial to Romney's main rivals: Texas Gov. Rick Perry, who got off to a strong start but has plunged in the polls after weak performances in previous debates, and Herman Cain, a businessman who ran a nationwide chain of pizza restaurants. Cain's recent ascendance in the polls has surprised a field that saw him as a marginal challenger when the nominating contest began. The debate at Dartmouth College will focus on the economy, the central issue in Romney's campaign, and one on which Obama is deeply vulnerable. But Romney's rivals could attack on a wider front. His rivals readied criticism on health-care policy, cultural issues and environmental positions. Even with a focus on the economy and voters most concerned about 9.1 per cent unemployment, there was no chance Romney would be able to dodge questions about his overall record. "Even the richest man can't buy back his past," Perry's campaign said in a web video that describes Romney, a multimillionaire businessman, as the inspiration for Obama's national health-care overhaul. Representative Michele Bachmann of Minnesota, whose candidacy has faded after early success in a straw poll in Iowa, urged conservative voters not to support a candidate who isn't one of them. "It's not good enough to settle for anyone but Barack Obama," she said while campaigning in New Hampshire on Monday. Even lower-profile rivals tried to knock Romney off his game. "Simply advocating more ships, more troops and more weapons is not a viable path forward," Jon Huntsman, the former governor of Utah and ambassador to China said in a foreign policy speech that was a direct rebuttal to one Romney gave last week that called for greater investment in military hardware. Both Perry and Bachmann have tried to pitch themselves as the conservative alternative to Romney, who as Massachusetts governor signed into law a health-care bill with a mandate to purchase insurance. That's also part of Obama's reform plan, which is loathed by conservatives. However, those candidates have stumbled in the polls. While New Hampshire has yet to schedule its primary, traditionally the first in the nominating process, it is likely to come before mid-January. That means there are fewer than 100 days for the newcomers to make inroads in a state where Romney is well known, owns a vacation home and won a second-place finish in his 2008 presidential bid.